The Comrades Marathon is known as the greatest ultra-marathon in the world. It is a marathon is about conquering not only the physical aspect of the race, but also the emotional and mental side of the race. Its also a race about the human spirit with an incredible amount of money going towards the Amabeadibeadi Charities that are supported by the race. The Comrades race is not a race in my eyes, it is a journey of heart and in some cases the heart involved is more immense than others. Although always a fan of the greatest race, my eyes were only opened to the true goodness of heart associated with the race through my involvement in the Unogwaja Challenge 2013. Of course each year there are some that show the selflessness, dedication, perseverance and spirit of Ubuntu that one would imagine with the Comrades more than most. Previous winners of the Spirit of Comrades Awards include a collection of the finest people our planet has ever encountered. Brad has worked tirelessly over the past four years to raise money for the Amabeadibeadi charity campaign. Not only did he overcome major physical obstacles to complete the Comrades Marathon several times, but Brad very selflessly gave of his time and effort to set up the Race 4 Charity website and inspired the special ‘CC – Charity seeding batch’ to motivate runners to raise funds for charity. The Race 4 Charity initiative has since raised R2.4-million rand for the Amabeadibeadi charities and Brad continues to inspire Comrades Marathon runners to race for charity and support the greater good. For his sterling efforts, Brad was awarded with the coveted Spirit of Comrades medallion. When fellow Aussie runner Joanne Tremonti had collapsed from hypoglycemia on Race Day, Joseph selflessly put his race on hold to carry her to the Comrades Marathon Medical Tent. Not only that, Joseph patiently waited 45 minutes for the ambulance to arrive. He remained there until Joanne had regained consciousness and was safely in the ambulance. After an hour and a half of waiting and caring, Joseph then went on to complete the race alone. He has been described as a kind and caring person and his noble deed went on to earn him the second prestigious accolade. 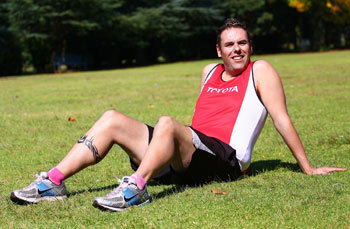 A British runner who ran the grueling 89km distance to drum up support for the endangered rhino. 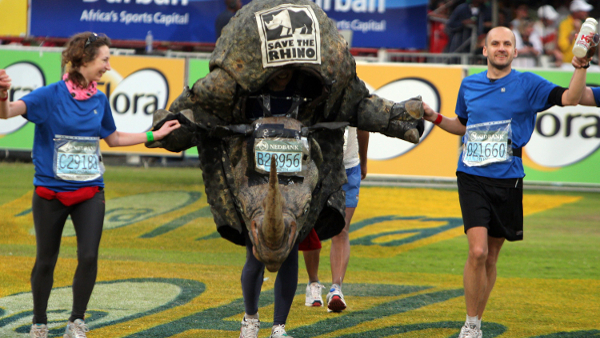 Vincent’s passion for saving the beleaguered rhino drove him to finish the epic race in a 12kg rhino costume, bearing in mind that the 2013 Comrades Marathon was also one of the hottest and most difficult races in nearly 40 years. Vinny was amazed at the camaraderie and support along the route, with many runners guiding him to the refreshment stations and even helping to feed him. Many runners were left deeply impressed by Vincent’s honourable deed in creating awareness of the incessant rhino poaching in our country; and creating a real spectacle of himself along the Comrades Marathon route whilst advocating a truly worthy cause. Please join hands in saluting these 3 incredible men who displayed more heart in 89km than many display in a lifetime.